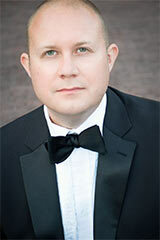 Bass-baritone Seth Keeton’s performances have been described by The New York Times as “driven” and “emotionally pointed.” He has performed roles on the stages of The Minnesota Opera, Glimmerglass Opera, Ft. Worth Opera, Central City Opera, Arizona Opera, Indianapolis Opera, Austin Lyric Opera and Opera Omaha, Chautauqua Opera, Mill City Summer Opera, and Theater Bremen in Bremen, Germany. As an oratorio singer, Keeton has appeared in concert as the bass soloist in Mozart's Requiem, Verdi's Requiem, Brahms’ Ein Deutsches Requiem, Bach’s Magnificat and St. Matthew and St. John Passions, Haydn’s Creation, and Beethoven’s 9th Symphony. In 2006, he was a national finalist in the Metropolitan Opera National Council Auditions and has received awards from the Sullivan Foundation and the Eleanor McCollum Competition.